The perfect way to help that little one with a very big step. 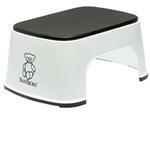 This sturdy, rock-solid stool will help them feel secure stepping up to and sitting on the toilet, with thick rubber matting providing a non-slip step surface, plus large rubber feet that hold firm regardless of where your child puts his or her feet. Also great for encouraging independence washing hands or brushing teeth at the sink. Bright red plastic adds a fun splash of color.